It is a metal panel located in a distant part of your home and you rarely think about it. Then the power goes out in the kitchen because you turned on the blender. Hitting the reset button the GFCI outlet doesn't help. Suddenly you need it. It is called the electrical service panel box. Homeowners might visit their electrical service panel box no more than once a year. For older homes with aging electrical systems, this might be a routine visit. For newer homes, there may never be a need to visit it. Homeowners performing even the smallest electrical repair, such as replacing an outlet or ceiling light, will need to visit it to turn off a circuit breaker. 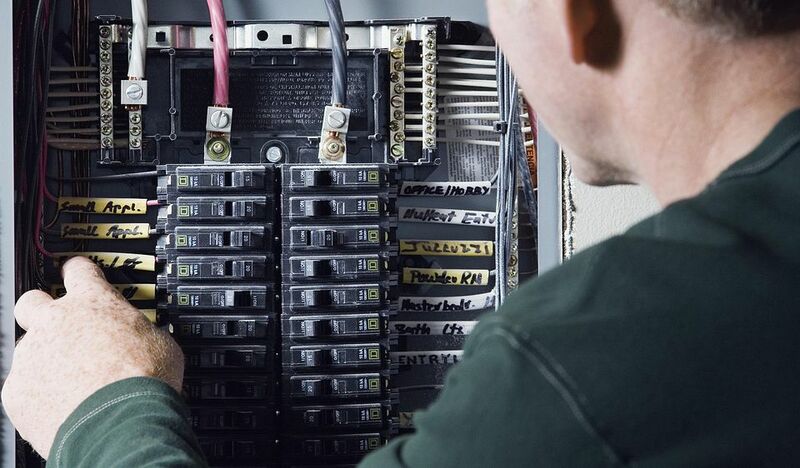 Your service panel is the connection between wires coming from the street and your home's electric system. It is the central distribution point that connects the service wire or service drop, which is the main wire coming from the outside into the house, to the exit wires that split off and service different parts of the house. These exit wires are called branch circuits or branch wire circuits. Service panels are called many different things: fuse box, fuse panel, circuit breaker panel. Today, most homes have what we call the electrical service panel, or simply, the service panel. It is not exactly the same as the fuse box because it has circuit breakers, not fuses, but it does perform the same function. The older fuses screw or pull in or out, as opposed to the rocker-style method of installing and removing circuit breakers. Homes built between 1950 and 1965 may have these 60-ampere fuse boxes, often with four fuses. All of your home's power is located in the service panel. The electrical service panel provides 100, 200, or more amps of power to a home. Power comes into the house from a service drop, connects to the service lugs within the service panel, and is split into separate circuits throughout the house. While not typical, a service panel may be found on the outside part of an exterior wall, especially in the case of older fuse boxes. When the service panel's outer door is closed, the service panel is safe to touch under normal conditions. When the outer door is open and the circuit breakers switches are exposed, the panel is still safe to touch under normal conditions. It is dangerous to work on an open electrical service panel with both the door and the protective front cover removed. Unlike the shock from a receptacle, which may or may not be fatal, a shock from the service lugs will most certainly be fatal or seriously hurt you. In the service panel, two black heavy-gauge wires enter the panel from the top of the box. These are the ends of the service wires that come into your house from the outside. Avoid touching these wires or anything that these wires touch. With that protective cover removed, shutting off the main power switch will not necessarily keep you safe. While it is often easy enough to be cautious of the things that your hands touch, be especially careful of tools that you are holding. The detached service panel, screwdrivers, wire cutters, wire strippers, pliers, and more are items that can potentially touch parts of the service wires and transmit an electric shock to you. You can add more circuits and circuit breakers inside your electrical service panel box as long as there are spaces. In most cases, the service panel will have available spaces. Some older homes may have completely maxed out their spaces. In this case, an electrician can install a new, larger service panel box. Generally, you can determine if there are more spaces by looking at the metal knock-outs on the panel itself. Any space that is not knocked out is available for insertion of another circuit breaker. Homeowners are allowed to work on the service panel, but many choose not to. Most homeowners only have the experience of opening the outer door of the electrical service panel to flip on a disabled circuit breaker. However, it is perfectly allowable for a homeowner to work on the inner section of his or her electrical service panel. For example, it may be necessary for the homeowner to remove and replace a circuit breaker. Many seasoned do-it-yourself electricians still choose to call in an electrician when it comes to any work that involves removing the protective front cover.